8 months - scar update. Scars are quite wide. I need to grown hair very long to hide it. @abysmoFrom my personal experience, i do not think that after 8 months suddenly all the sleeping hairs will pop out. If it is not shown out by 6 months it is most likely dead. Do not have false hope that suddenly it will burst. Update -7 months 25 days No new hair growth, transplanted hair getting thicker. Density is not very good, since I have my hair long it compensate for the density. I hope that it improve in the coming months. @Hair Lover You can PM me @sharmaarya Design was good but the growth as not very good. Many did not grow at all. I would say 60 percent grown. Density is lacking, we will see in the coming months. And to note I was not completely bald before surgery. 6 months Nothing much to say I do not see any new hairs. It is quite patchy. New hair sprouts after 6 months really possible? I have sent the pictures to the clinic but no reply yet from them. @Yake It depends on your hair loss. If you have large area to cover. It is best to start with FUT. Which is why I went for FUT. If FUT is done properly it is a great procedure with thin line scar and solid growth. But it does not seem the case in india. Mostly it looks like hit or miss for doctors. I think out of 10 they may succeed with 2 or 3 with good result with thin scar. They publish those results in the forum and many believe they will get the same result and get disappointed in the end. We see more case now with poor result from Dr Soni in this forum. We do not know about others who had poor result and they are not in this forum. I am not sure about my progress and I am at 5.5 month mark and do not see many new hairs, and some areas in the hairline have zero growth, do not know there will be new growth in the coming months. We will see at 12 month mark. May be forum moderators can help me. @DhyanIs your mid scalp scar wider like my side ? What do you think of my growth so far in the front and crown? Here is my 5months update. I do not see a big improvement from 4 months to 5 months in the front but there is some growth and crown ( not to bother for now I guess). Still I see a lot of areas have not started to growth. The ones already sprouted are growing at a very slow phase. Not sure how much density I will get in the coming months. The scare is bad on the left side and right side is fine. I hate how my crown look. I am thinking of using Dermatch until the next transplant. Is it ok use them now? Any advise. I do a lot of sports thats is why dermatch as it is sweat and water proof. 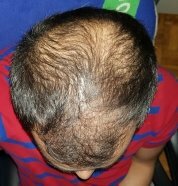 I am thinking of an FUE surgery next time for the crown and mid scalp. What you guys think? I do not know what to say about your result. I really feel sorry for you. I am in similar situation and I had surgery with Dr Soni I am at 5 month mark and more patchy areas with no hair. Not sure how it will turn out at a year mark. As far as I read if the new hair did not show up by 6 month mark even as a tiny sprouts , it is more likely it won't grow at all.